It is a fantastic documentary about Chinese govt's systemic oppression and persecution toward ordinary folk who petition the government. A portrait of poverty, ambition and hope set in a world of waste. It recounts the harrowing story of life at one of Mao's camps, at the end of the fifties, where 'rightists' were sent to be 're-educated through labor'. Yu Hong leaves her home village and starts university in Beijing, where she develops a consuming and compulsive relationship with another student. The student riots from 1989 then ensue and take a toll on their lives. In a small town near China's North Korea border, a state police station exerts itself as a solicitous caretaker of the locals. As it goes out to catch criminals and punish them too, professionalism fades into the background. 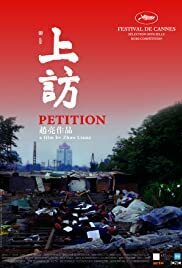 Over the course of 12 years (1996-2008), director Zhao Liang follows the 'petitioners', who travel from all over China to the nation's capital, Beijing, to make complaints about injustices committed by authorities in their hometowns and villages. Without this documentary knowledge of today's China won't be complete. Any kind of fiction is powerless in front of the complex and dramatic real life stories it preserves. I watched the 2010 five hours-long director's cut of Petition with a full house of some two hundred audiences. We were all captivated deeply by the drama, the humour, and above all, the tragedy in this groundbreaking documentary. In China people who seek intervention from higher authority to correct the injustice they suffered have been existing for more than half of a century, but it waits until today when there is DV camera and more importantly a brave film maker we are able to learn their life stories directly, with our safety hold in hand. This is a shocking experience, few people expect the surge of emotion they felt during watching. Some parts of the film are so heart-wrenching that I think the majority of the audiences burst into tears during those moments. I myself cried more than I had in several years. But there is no sentimentality here, the situations are too harsh to react irrationally. You are struck to ask questions, why is the Chinese justice system failed, what can we do for these suffering people, can we sit well and enjoy one more single day of wealth when these members of our own race are deprived of basic decency of human being?